Pilates Fitness @ Telok Blangah will be relocating to Telok Blangah House (next to Bay Hotel, opposite Vivocity) due to building redevelopment. Last day of operations at current studio is on 23 Oct 2018. We will re-open at the new location on 27 Oct 2018. Click here for list of FAQ. WE ARE LAUNCHING $40/CLASS PROMO TO CELEBRATE OUR MOVE. LIMITED TO FIRST 5000 CLASSES SOLD. Promotion is valid till 6 October 2018, 23:59 hours. 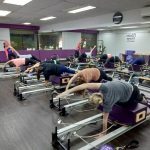 Joining fee of $49 per new member applies and must be paid over Pilates Fitness reception before classes can be used. Each Create Your Own Class Bundle purchased can be shared among a maximum of 5 members. All classes are by appointment only and class prerequisites apply.